Established in 1863, as Boulder Valley Presbyterian Church, Valmont is Colorado’s oldest continually meeting Presbyterian congregation. Our members include families descended from original area homesteaders, as well as university students, retirees, and families with children. The following is excerpted from Of Valmont Vintage, published in 1981 by Valmont Community United Presbyterian Church. 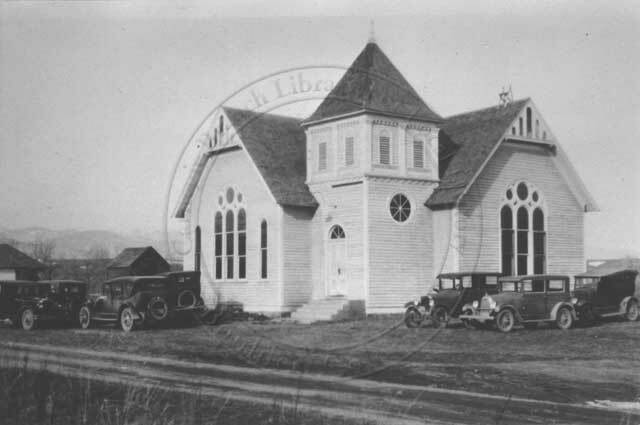 The Christian congregation, which is now known as Valmont Community Presbyterian Church, was organized on September 6, 1863. The town of Valmont was near the confluence of North Boulder and South Boulder Creeks in Boulder County, in what was then The Colorado Territory. The history of this church congregation has been well told in The First Hundred Years 1863-1963, prepared by Theodore B. James and published by Valmont Church on the occasion of its centennial celebration in 1963. I cannot be sure whether our first church services were this year (1865) or not. I remember that we used to go to a fine cottonwood grove on Mr. Wallace’s place on the other side of the Boulder (Creek), beyond Valmont. Long boards were placed on logs or something and the preaching and singing was outdoors in the shade. Then the Presbyterian church was built, wonderfully large it seemed to me, with a big bay window back of the pulpit, and at first we sat on boards placed in rows and along the side walls. In due time large comfortable pews with high backs were put in and on the right side of the isle on entering was a large open place where the great stove stood that heated the building. About the fourth row from the front on the right hand side was our pew, ours for many years…. Immediately in front was the Housels, our closest friends…. In front of the Housels sat the Chambers, a large family that often spread over into the seat in front of them. In later years the Davidsons … occupied the seat behind us. The church was the center of our social life. This church building and a small brick church built two or three years later by the Methodists served the community for school and religious purposes for several years. The first frame building of Valmont church was built in 1866 during the tenure of The Rev. Charles M. Campbell. It was dedicated on July 10, 1881. In 1899 a new sanctuary was built which incorporated parts of the west and north walls of the old building. This sanctuary was added onto in the 1940’s and 1950’s, and was later redecorated. On March 3, 1979, the building which had housed The Valmont Community United Presbyterian Church for most of its 117-year history burned to the ground. This loss served to make real to the Valmont congregation what we had already known in theory: the church is not a building, but a people. Family life usually goes on in the setting of a wider community, and the Community of Valmont has been that context for many of the families of Valmont Church. The whole town (of Valmont) consisted of only a dozen or fifteen houses. The most active center was the, Donnelly store, in which I remember particularly the long counter on one side with the opening in the middle for the store keeper to pass back and forth. On the shelves behind were piles of calico and a row of glass jars, some containing stick candy with red and white stripes, others long sticks of horehound candy or black sticks of licorice. There was also a box of licorice root and a box of curled cinnamon bark. On the front counter stood a glass case containing small things, threads and the like… Toward the back of the big store were big boxes and barrels containing molasses and other things. On the counter was a pile of long slabs of cod-fish. Opposite the store was a great big brick building two stories high. The upper story, approached by an outside stairway, was a large hall used for the Good Templars Lodge and other gatherings and later for the “Grange”. The largest and most conspicuous building was the Presbyterian Church in the middle of the town, with its great high windows on each side; and close under the Buttes was the Methodist Church, long used for the school house and smaller gatherings. 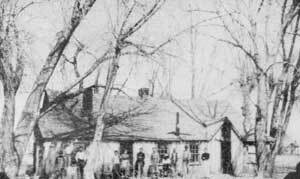 Between the Methodist Church and the large brick building was a small house where the doctor, a bachelor, lived. I remember only the one room used as his office, and the cream colored horse that he usually rode. With all the necessary medicines and instruments in his saddle bags he rode at high speed, a continuous fast gallop, and always leaning back in the saddle… West of the store was a sort of public house or inn, with large stables for transients. This was run by Mr. and Mrs. Jones… A short distance south of the store was a sort of drug store, where more “bitters” than medicines were sold… West of the church was the Hayes blacksmith shop…. Worship of God and celebration of the sacraments are an important part of the Christian life. The Valmont Church has always been a small congregation, about 200 members at its largest. Sometimes there have been ordained ministers to lead the worship; sometimes they have been shared or yolked with another congregation. At other times the congregation has had a commissioned lay preacher, or has had lay leadership from within, under a moderator appointed by Presbytery. 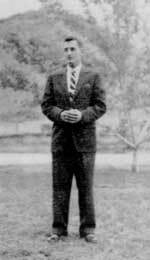 The Reverend Allan H. Swan came to serve the Valmont Church in 1954. At that time Valmont was yoked with the Nederland Church, with additional support from the local and national church. Nederland had church at 9:00 and Valmont at 11:00. Even if Nederland and Valmont are only 20 miles apart, in those days it was some drive! Some of the roads weren’t paved, and the Narrows in Boulder Canyon were still narrow, and there was many a hairpin turn that you don’t see now-a-days. So to make it to Valmont on time, Al had to drive like the devil was after him. The Valmont congregation used to stand on the front stoop looking to the west up Valmont road. When we spotted a plume of dust coming down the road at breakneck speed, someone would ring the bell; the Reverend was about to arrive in his Ford station wagon. For some people, corporate worship has been a deeply moving experience. In 1861 my grandfather, Rasmus Parsons, left his job as head gardener for the King of Sweden to come to America. He was 28 years old at the time. The search for his personal utopia led him through Chicago and then, walking behind a wagon train as a herder, he arrived in Boulder and pushed on to the booming Central City area. After he had spent some time there doing carpenter and cabinet work, he heard of a job-opening on the Teller Ranch, approximately four miles east of Valmont in the Davidson area. So he walked from Central City to the Teller Ranch and applied for the job. Believing that he had been given the position, he tried to be plain in his broken English that he would go back to Central City get his clothes and tools, and return to work. Upon his return to the Ranch, ready to start work, he found he had been misunderstood and the job had been given to some one else. Discouraged, weary, and lonely, he started back to Boulder and, upon approaching Valmont, he heard music coming from the Valmont Church. He entered the church, found a seat in the back, and sat down and cried, because although he did not understand the words, the music was hauntingly familiar to a homesick man.